Michiel de Lange highlights in his Blog the second issue of the RMIT University journal Second Nature, which is about “Games, Locative and Mobile Media”. 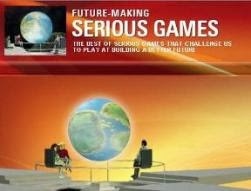 In the article, de Lange discerns five possible ‘levels’ to understand urban games: (1) the city is often used as a model to construct an architecture of computer and video games; (2) the city itself has historically been understood in multiple ways as a game or playground; (3) pervasive games take digital games out to the streets and bridge the digital-physical distinction; (4) (serious) games are used in the process of (re)building actual cities; (5) urban games are a metaphorical lens through which to look at utopian and dystopian futures of cities. De Lange states that is no longer possible to talk about the city as being only physical or local. The geographical city, with its physical infrastructure, co-present social interactions, and diverse local cultures and identities, is overlaid with the “Hertzian space” of electronic communication-, information- and observation-networks of GSM, GPS, CCTV, UMTS, WIFI, RFID, and so on. Nor is it possible to see the digital realm as purely ‘virtual’ (not real or not material). Increasingly, digital spaces are tied to geographical locations. ICTs are embedded into physical objects. The physical city and the spaces and practices of digital technologies merge into ‘hybrid spaces’. The central issue raised by The Mobile City project is: what happens to urban cultures and identities when physical and digital spaces merge? The Mobile City was founded by Martijn de Waal and Michiel de Lange, two PhD students from the Netherlands. The project aims to bring together professionals from various fields (academics, urban professionals, media designers, artists, telecom business, etc). 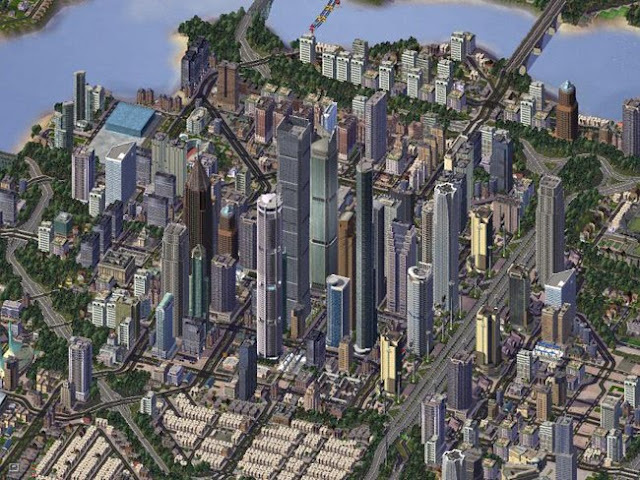 What is the relevance of urban gaming for the issues raised by The Mobile City project? De Lange makes an analytical distinction between five domains or ‘levels’ where games and urbanism meet – one of them are Serious Games. Here “urban games” are understood as games used in the process of (re)building actual cities, with Serious Games being employed for architectural design and spatial planning. 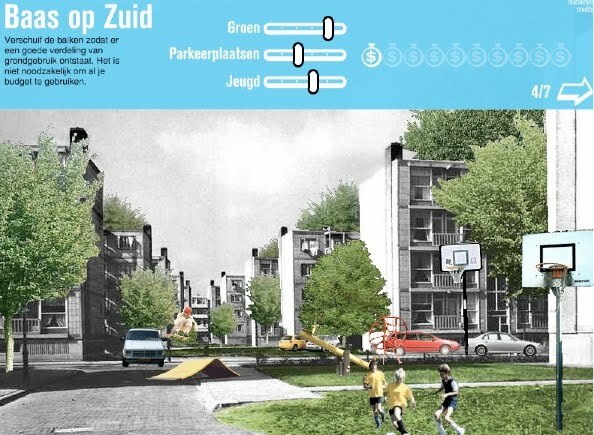 An example from the Netherlands is the game Baas op Zuid created by BBVH architects in cooperation with various public housing agencies. 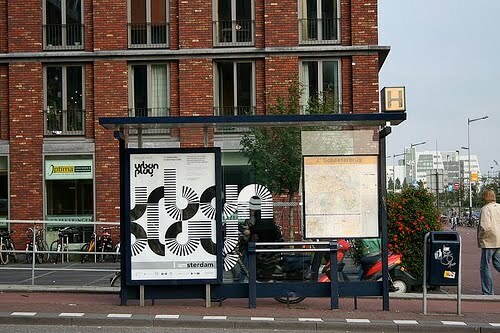 The game was used to help in the redesign of two old neighborhoods in Rotterdam. Players are presented with a number of concrete design choices for their neighborhood to which they can interactively respond. They get instant feedback about the consequences of their choices. For instance, more parking spaces at the expense of trees inevitably means more noise and visual pollution. An overall score reflects whether these choices fit with the particular character and history of these neighborhoods. Outcomes were aggregated and sent to the planners. Other disciplines too now turn to “play” for urban design. The 2008 event Urban Play organized by Dutch design collective Droog explored the role of designers in shaping the urban landscape. Nineteen designers were commissioned to create playful urban design interventions. The Urban Play project believes that street-level inventiveness, energy and innovation is the future of creativity in the city. It aims to be a catalyst to inspire creativity in the public domain. A weak point in this project was that instead of employing design quite literally as un-coding (and re-coding) pre-inscribed urban situations, the majority of projects only provoked reactions instead of lasting co-creations. According to de Lange, the question remains open whether Serious Games actually work in making participatory reinvigoration of cities more fun, or are simply what they are: just play? Michiel de Lange concludes the article by saying that these five levels where games and urbanism intersect cover a wide spectrum of possible meanings of “urban games”. The Mobile City will keep an eye on ‘urban games” in this very broad sense to better understand their central inquiry: what happens to urban cultures and identities when physical and digital spaces merge? As new technologies evolve and mature, they infiltrate our lives in ways we don't necessarily expect. An urban gamer playing "Uncle Roy All Around You"
People around the world have been putting these technologies to innovative use, creating "experiences" in public settings that are part game, part performance art, and part sociology experiment. Dubbed urban gaming, these activities can range from recreating the 80s video game "Pac-Man" on a human scale in New York City to hiding "treasures" in state parks for people to find via GPS. Urban gaming is such a new phenomenon that a strict definition is hard to come by. All urban games have a few things in common, however. They all take place in public spaces. Often this is a city, or a defined area within a city, but some games take place in wilderness areas, such as state parks and other publicly accessible places. The play space is always much larger in scale than traditional games -- in fact, it could be said that they occur at "human scale," rather than a miniature scale on a tabletop, or as an abstraction in a computer game. 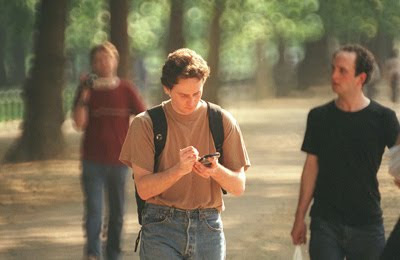 Finally, all urban games incorporate communication technology, such as cell phones, GPS receivers, digital cameras, and the Internet. The organizers of urban games, also called "location-based games," often have more lofty goals in mind than enjoying new technology. The potential benefits of urban gaming are numerous. 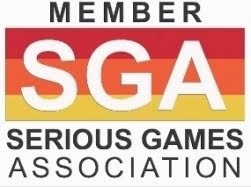 The social interaction and feelings of adventure when out exploring new settings or working to solve puzzles can be very rewarding. These social forces can have dramatic repercussions for the city.